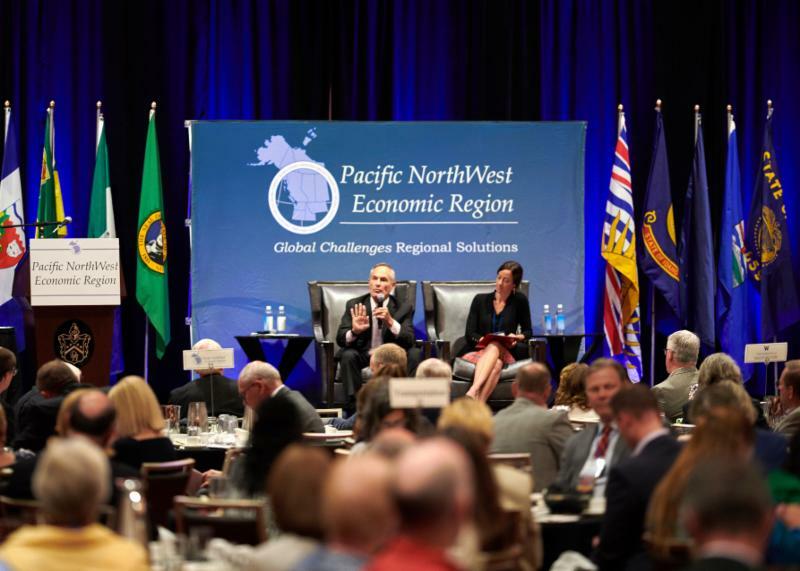 Over 600 regional legislators, business leaders, academics, and policy makers gathered in Spokane, WA on July 22-26. With 27 working group sessions, 6 keynote plenary sessions, and 7 policy tours, attendees had the opportunity to engage in dialogue, strengthen regional relationships, and address the various challenges that affect the region. 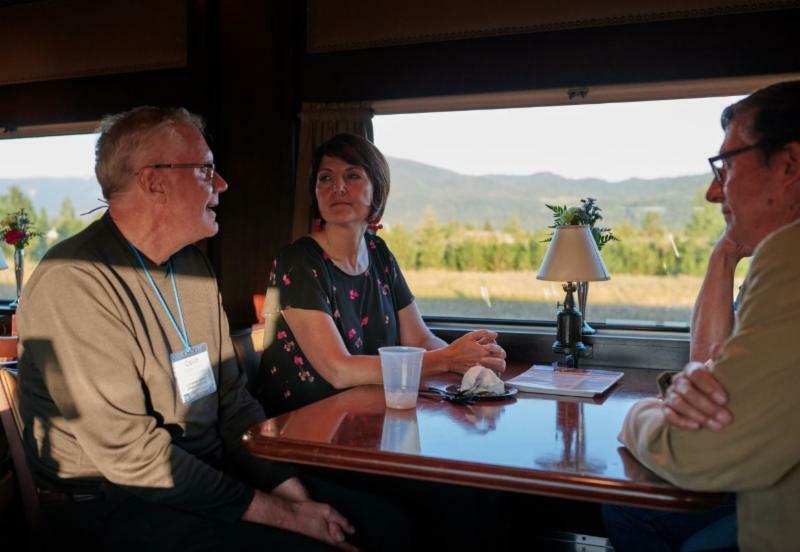 Washington State Congresswoman Cathy McMorris Rodgers ( middle ) in discussion with Colin Robertson , Vice President of Canadian Global Affairs Institute ( left ) and Matt Morrison, Executive Director of PNWER ( right ) during a study tour through Washington and Idaho hosted by BNSF Railway. 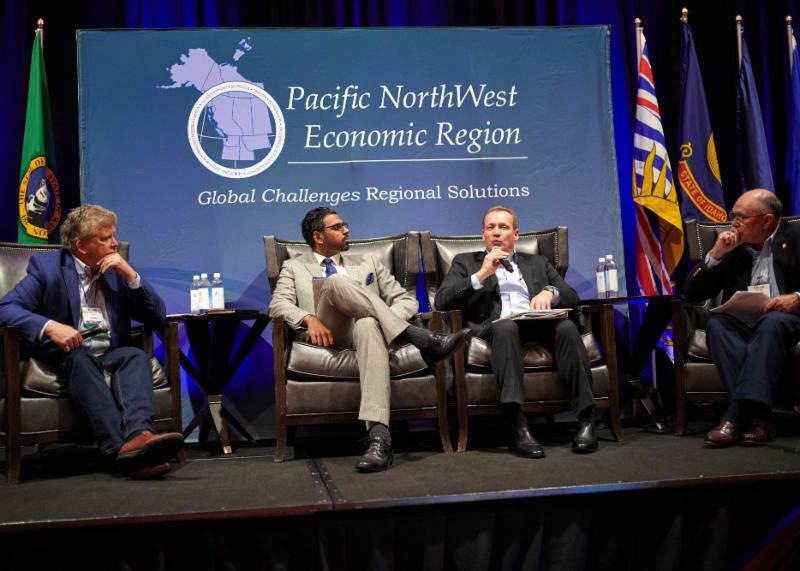 Monday's breakfast featured a keynote trade panel. The panel was moderated by former U.S. Ambassador to Canada David Wilkins , Partner, Nelson Mullins Riley & Scarborough. Chris Sands , Senior Research Professor and Director of the Center for Canadian Studies with Johns Hopkins Center School of Advanced International Studies and Director of the Center for Canadian Studies; Colin Robertson , Vice President and Fellow with the Canadian Global Affairs Institute; and Dan Ujzco , International Trade Lawyer with Dickinson Wright ( from left to right ) spoke about the current state of North American free trade. The session was hosted by BNSF. To watch TVW's recording of the event, click here . Monday's plenary lunch topic was the "Border of the Future" with a talk from Alan Bersin , former Assistant Secretary for the U.S. Department of Homeland Security ( left ) and prepared remarks from John Ossowski , President of the Canada Border Services Agency ( video ). Laurie Trautman , Director of the Border Policy Research Institute at Western Washington University, ( right ) moderated. The session was hosted by the University of Washington. To watch TVW's recording of the event, click here . Evan Reis, Executive Director and Co-founder of the U.S. Resiliency Council ( above ) spoke at Tuesday's breakfast about the steps that communities and leaders can take to strengthen their resilience in the wake of natural disasters. Hosted by Pacific Northwest Building Resilience Coalition, the session explored how the region can be better prepared. ﻿To watch TVW's recording of the event, click here . During Tuesday's luncheon, Vicki Christiansen , Interim Chief at the U.S. Forest Service ( above ) spoke about advances in fighting forest fires and managing the nation's forests. She was followed by Fritz Wolff , Board Member and Co-founder of Katerra, ( below ) a company that is developing new approaches to building using cross laminated timber. This session was hosted by Avista. To watch TVW's recording of the event, click here . 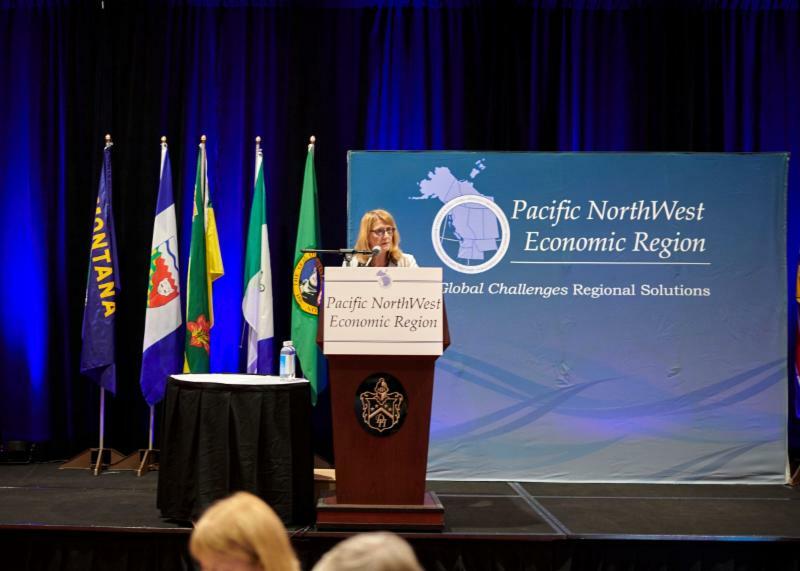 Attendees of Wednesday's breakfast heard remarks from new PNWER Vice President Hon. Bob McLeod, Premier of the Northwest Territories ( above ) and Hon. 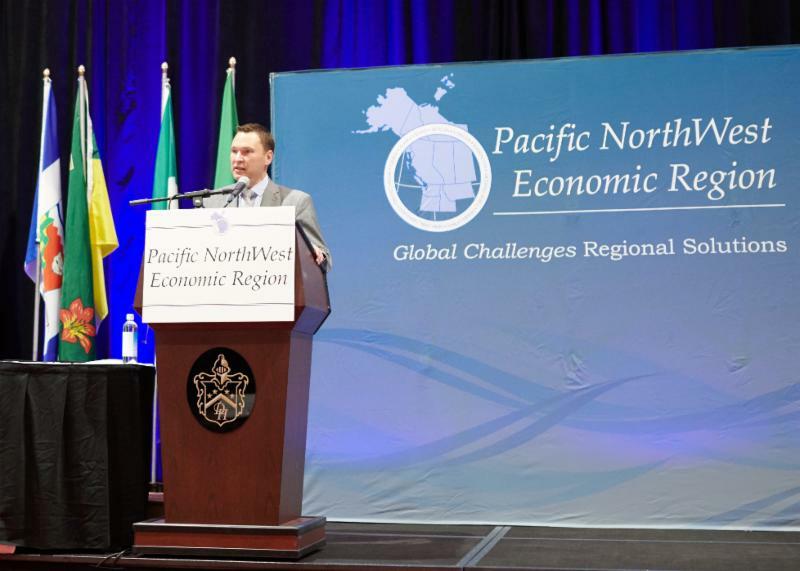 Deron Bilous, Minister of Economic Development and Trade for Alberta ( below ) about the historic role and importance of partnerships throughout the region as they relate to trade and sustainable economic development. The Washington Companies hosted this session. To watch TVW's recording of the event, click here . 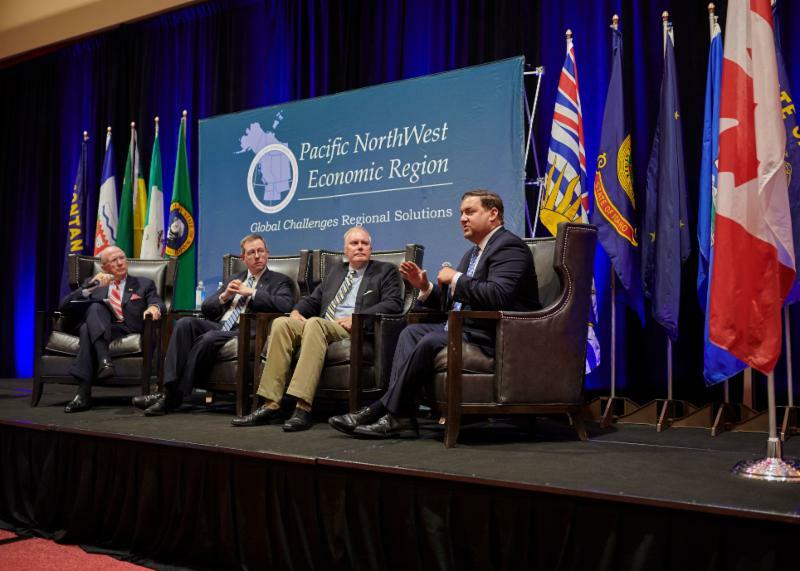 Bruce Agnew , Director of Cascadia Center; Victor Thomas , Vice-President, Prairie Region, of the Asia Pacific Foundation of Canada; Stephen Metruck , Executive Director of the Port of Seattle; and Senator Chuck Winder of Idaho spoke at Wednesday's plenary luncheon. ( left to right ) The speakers discussed how to grow global competitiveness through expanding markets and infrastructure. This session was hosted by Enbridge and PSE. To watch TVW's recording of the event, click here . 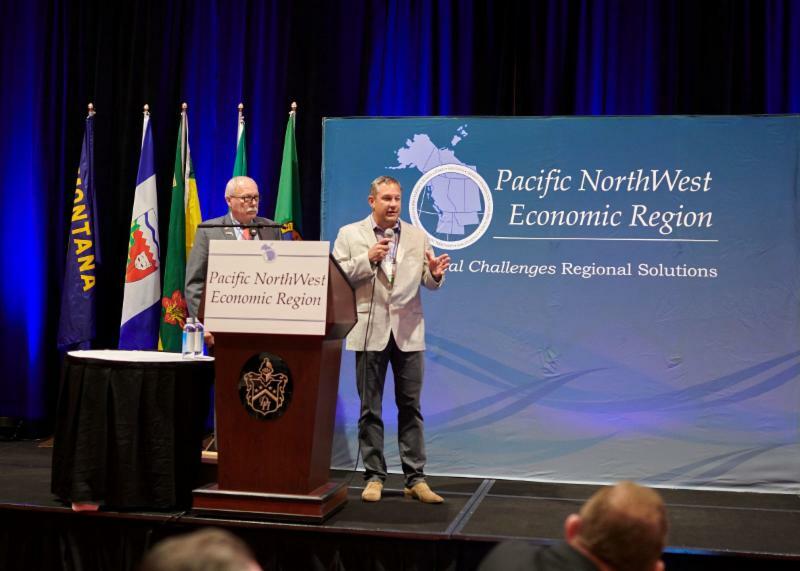 The Columbia River Treaty Symposium was held in conjunction with the PNWER Summit this year. Jill Smail , US Chief Negotiator for the Columbia River Treaty ( above ) and Sylvain Fabi , Canadian Chief Negotiator for the Columbia River Treaty ( below ) spoke about the importance of the treaty to the region and the two nations. To watch TVW's recording of the event, click here. Click here to view this year's approved action items from each working group. 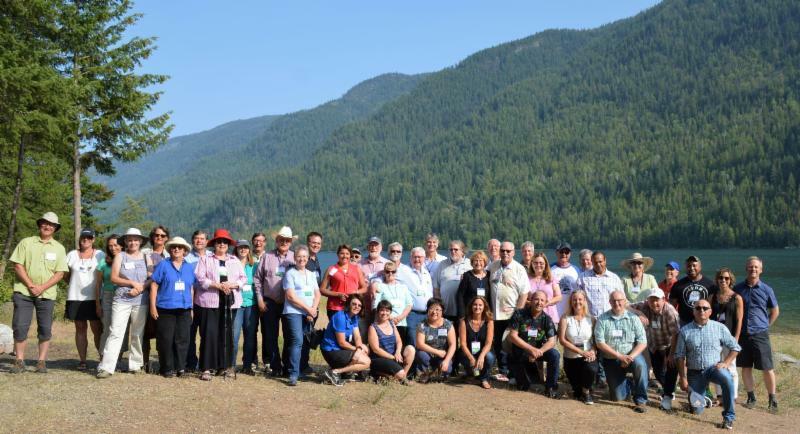 Experts from across Canada and the US presented on a number of topics and participated in roundtables in the numerous working group sessions and plenary meals. Below you will find links to the Summit agenda and full program as well as the Summit sessions where you can view each session's agenda, speaker bios, and available presentations. 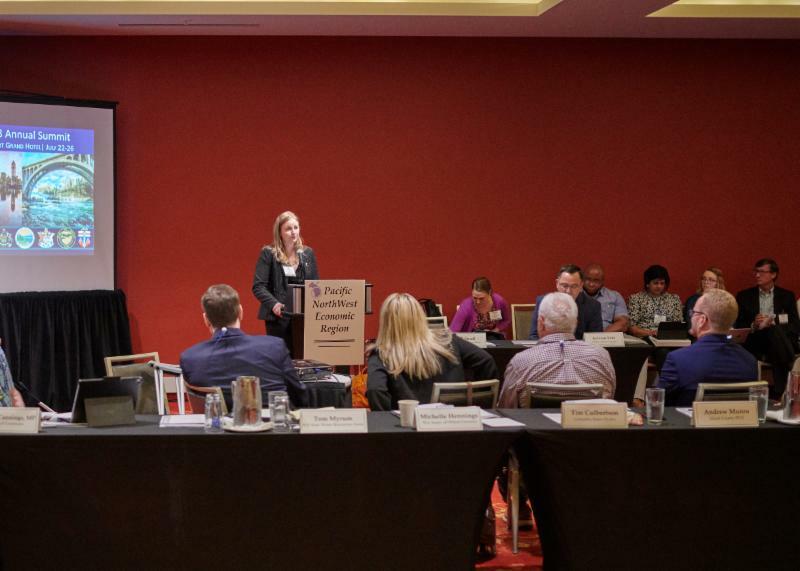 Washington State Public Affairs Network, TVW, was on hand at the Summit to film and broadcast Working Group Sessions and Keynote Speeches. To view TVW's recordings of those events, click here. 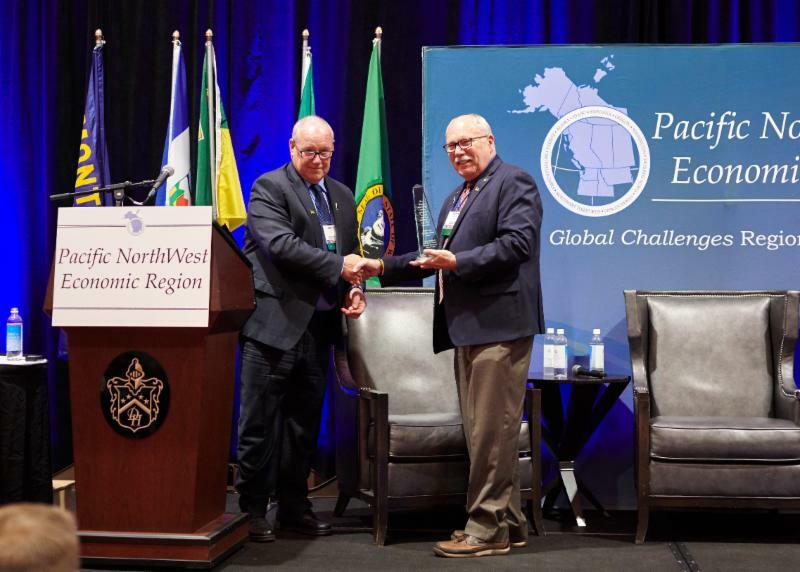 The Alan Bluechel Memorial Award was given to Brad Smith, President of Microsoft in recognition for his efforts over the past year to develop the Cascadia Innovation Corridor and cross-border relationships. 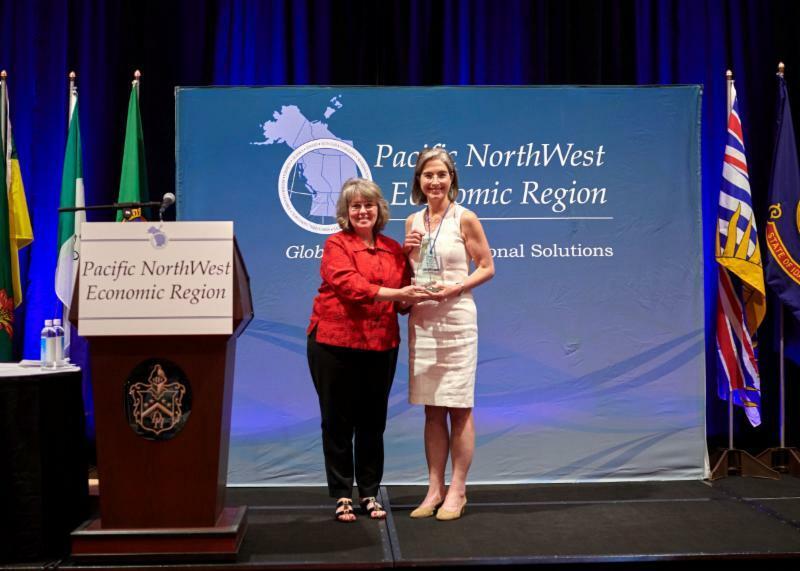 PNWER VP Rep. Gael Tarleton (left) of the Washington State Legislature presented Irene Plenefisch , Director of Government Affairs for Microsoft ( right ) with the award on Brad Smith's behalf. 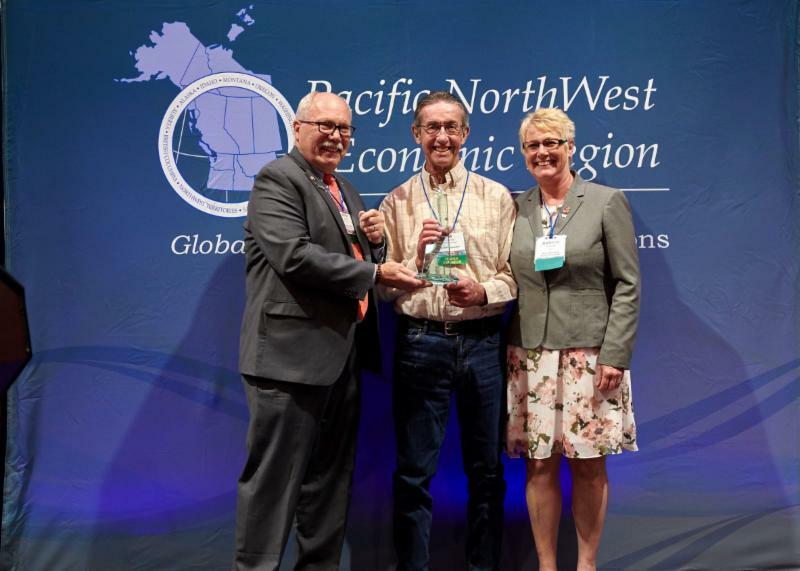 The Private Sector Leadership Award was named in honor of PNWER's founder, the late Washington State Senator Alan Bluechel who envisioned the establishment of a collaborative region-wide organization to address common issues and interests. Alan Bluechel served as PNWER's first president . Senator Arnie Roblan presents Former MLA Ed Conroy and The Honourable Katrine Conroy, Minister of Children and Family Development and Minister responsible for Columbia River Treaty, British Columbia (left to right) the Hot Potato Award for their years of work regarding Columbia River Treaty issues. The Hot Potato award is given each year to regional leaders who have helped reduce tension across the border and is named in reference to the Pig War of 1859. 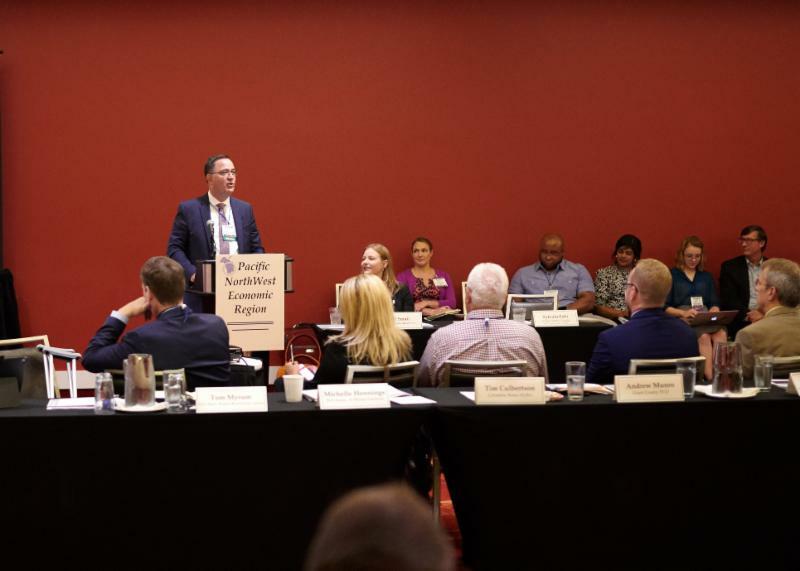 Attendees at this year's Summit were invited to participate in several informative policy tours for a first-hand look at the issues and challenges that the region faces. 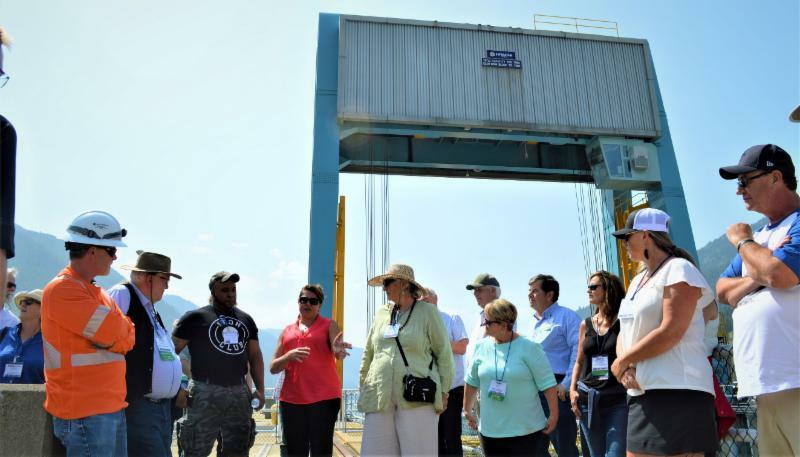 Policy tours took attendees to Fairchild Airforce Base, Kaiser Aluminum, Grand Coulee Dam, and a special, two-day study tour to British Columbia for sites significant to the Columbia River Treaty. 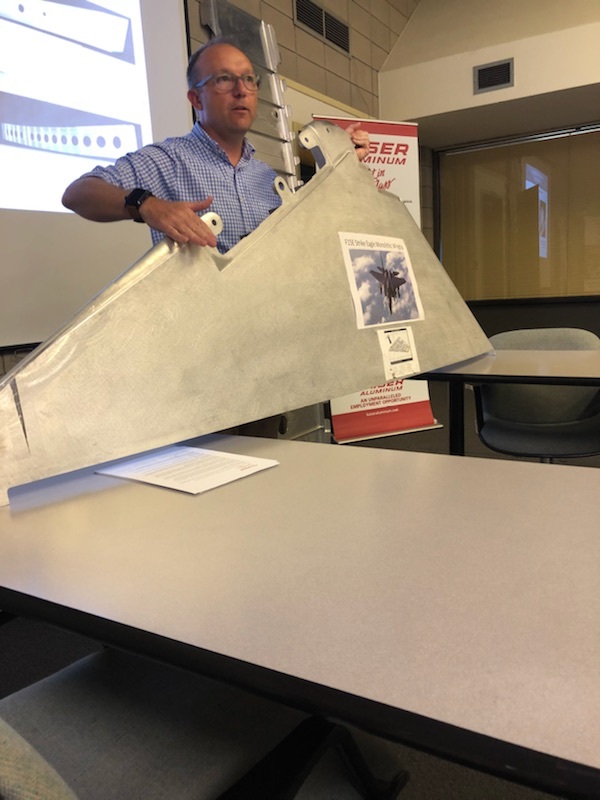 Kaiser Aluminum representative shows an example of how Kaiser's aluminum is used as part of an airplane wing for Boeing. 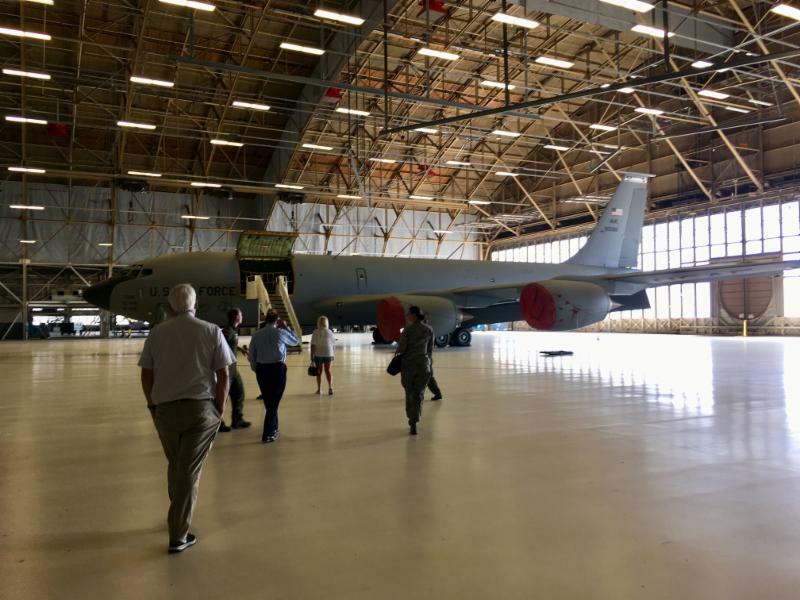 Attendees tour a KC-135 Stratotanker at Fairchild Air Force Base. Audrey Repin , Columbia Power Corporation, speaks to CRT participants at the Keenleyside Dam in Robson, BC. 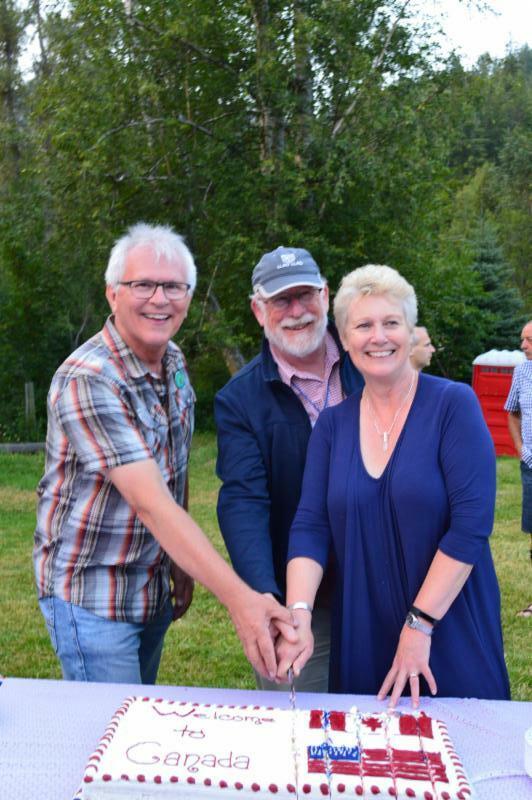 Wayne Stetski, MP, Richard Cannings, MP, and Hon. Katrine Conroy (left to right ) serve cake to welcome Canadian and US representatives in BC. Several Summit sessions focused on the impact of tariffs on the region. 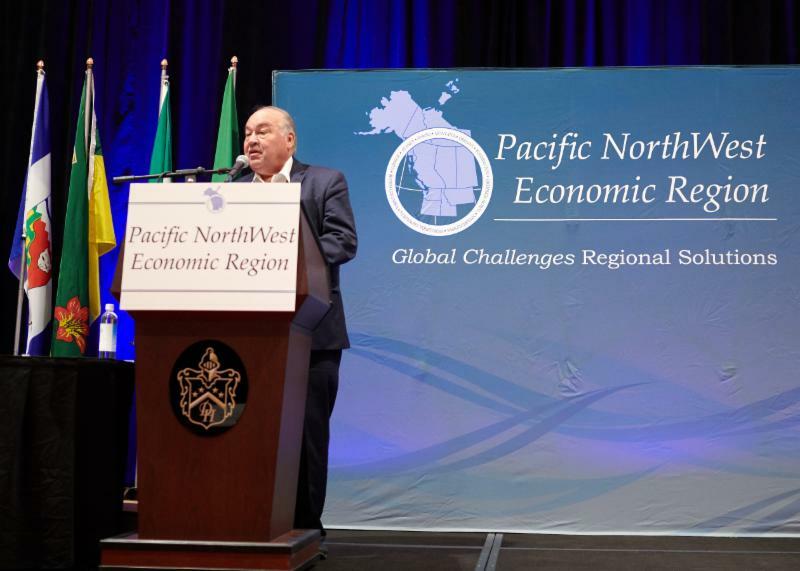 As an outcome of the Summit, PNWER issued the following statement on tariffs. We believe that new unilateral tariffs between the US and Canada go against the principles of free and fair trade and only harm industries in both countries. When markets are open and goods are transported freely across borders, the result is economic growth, new businesses and more and better job opportunities for individuals. Below are just a few of the highlighted stories from the Summit. 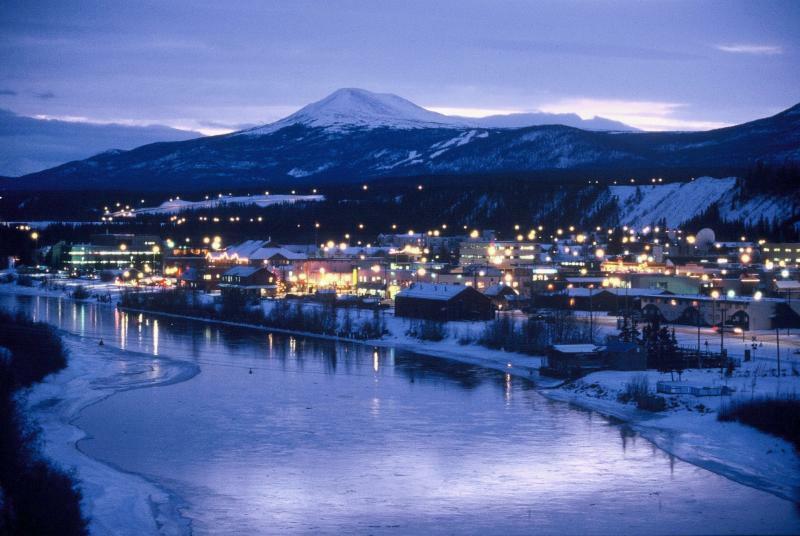 You are invited to the 2018 Economic Leadership Forum to be held November 13-15 in Whitehorse, Yukon. The Annual Economic Leadership Forum's purpose is to give delegates an opportunity to learn about key economic issues, collaborate with US and Canadian counterparts, and strengthen regional ties. Registration is now open! Click HERE to register today. 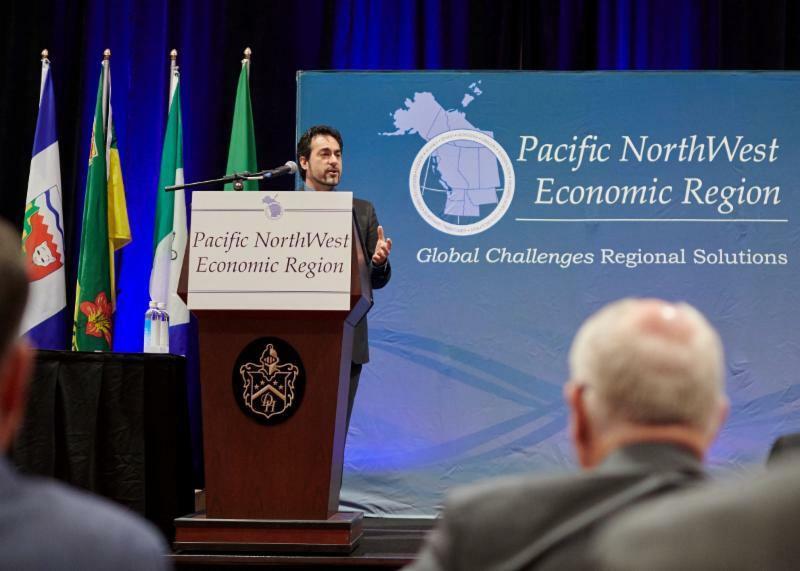 Stay up to date with the latest PNWER news and activities. Check our Facebook page or our Twitter feed for the latest photos and highlights.